Aside from an occasional gyro, I will admit I have never been much of a connoisseur of Greek cuisine. If asked to choose a Greek, Mexican or Italian restaurant, for example, Greek typically wouldn’t win the contest. This, however, was before I discovered The Simple Greek, a new eatery that serves Greek food fresh and fast with a build-your-own concept similar to Chipotle or Subway. 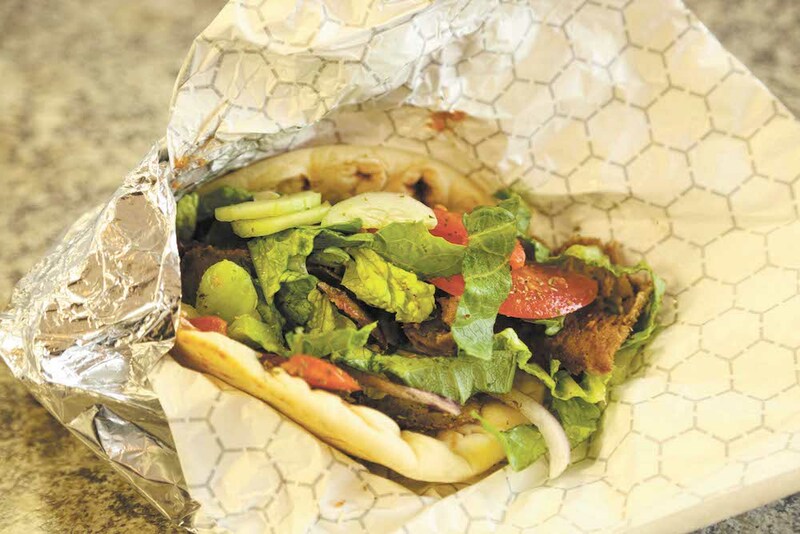 With newly opened locations in both Hermitage, Pa., and Boardman, The Simple Greek is leaving favorable impressions on many taste buds, including my own. During my recent visit, I sampled everything from traditional Greek soups to pitas to desserts, and I can’t wait to return for more. Sean Ferrier, who owns the Boardman and Hermitage locations along with his wife, Rebecca Ferrier, and husband and wife Ron and Lori Taylor, said business has been bustling. My introduction began with a build-your-own bowl (small $6.95 and regular $8.95). My bowl had a salad base topped with hand-stacked chicken (cooked on a spit), Lemonis potatoes (roasted with lemon, butter and oregano), garlic green beans, red onions, olives, feta and tzatziki sauce. The creamy crumbly feta, the savory chicken, the tangy potatoes, the crunchy lettuce – oh, what a beautiful blend of tastes and textures! The build your own menu allows patrons to select a white or wheat pita ($6.95), or a bowl (prices listed above) with rice, lentils or salad. Protein options include a traditional gyro, chicken gyro, grilled steak, grilled chicken or lentils. Sauces include tzatziki, hummus, spicy hummus, Greek dressing and garlic cream. Toppings consist of cucumbers, tomatoes, red onions, village salad, feta cheese, shredded lettuce, Kalamata olives, garbanzo beans, pepperoncinis, oregano, sea salt, olive oil and vinegar. As I continued to sample The Simple Greek’s most popular items, I found myself in agreement. Alongside my bowl, for example, I enjoyed a serving of Greek fries ($2.95). Seasoned with garlic salt, oregano, red wine vinegar and feta cheese, these hand-cut potatoes are a filling and delicious compliment to a meal, or a hearty snack on their own. The savory blend of seasonings and the feta cheese really give them the wow factor. The dish that garnered an even bigger wow from me, though, was the authentic Greek yogurt ($4.25). Let me just say the Greek yogurt served at the Simple Greek is in another realm compared with the Greek yogurt you may have purchased from the grocery store. Made with both goat’s milk and cow’s milk and served with fresh strawberries, blueberries and Greek honey, this yogurt was the creamiest and dreamiest I had ever tasted. I also have to emphasize that the imported Greek honey (Orino brand) used to garnish the yogurt is incredibly sublime – like golden nectar from the gods. Since I’m focused on sweet stuff, I must also mention the rice pudding, or as the Greeks would call it, rizogalo ($2.95). This rich, creamy treat is a traditional favorite. Sprinkled with a delicious dusting of imported Greek cinnamon, the pudding smells as yummy as it tastes. Before sampling any more desserts, I tasted the restaurant’s two soups – avgolmono soup (chicken, lemon, rice soup) and lentil soup (both $2.95). Avgolemono soup is a traditional Greek favorite. I have to say it’s one of the best soups I’ve ever had. The creamy rice and delicate flavor of lemon blend beautifully with tender chunks of chicken. This soup is light enough to enjoy during summer, yet hearty enough to fill the tummy on a chilly winter day. The lentil soup is hearty and pleasing as well, with lentils and vegetables in a vegetable broth. Speaking of vegetables – the Spanakopita (spinach pie) is a tasty little pastry stuffed with feta cheese and spinach ($2.95). The light, flaky crust and warm filling are prepared to perfection. I concluded my feast at The Simple Greek with the most decadent item on the menu – the Baklava cheesecake ($3.65). This creamy cheesecake with layers of baklava, walnuts and honey is superb and reasonably priced when considering the size and quality of the slice. In fact, overall, all of the prices on the menu are quite affordable. The Simple Greek relies on authentic family recipes and prepares food made with fresh, imported, premium ingredients. Marcus Lemonis founded The Simple Greek franchise in 2015. He was inspired by a concept introduced on his CNBC reality TV show The Profit. Lemonis had been seeking a way to share his love of Greek food with the world. The Simple Greek was franchised in 2016. Fifteen locations opened in the United States in 2017, and an additional 30 locations are scheduled to open in 2018. The Simple Greek also offers catering services.